The review takes place from the point of view of a non-specialist in design education and offers an insightful snapshot of current art and design pedagogy in both higher education institutions and museums. Utilising an ethnographic approach Lyon conversationally examines a series of interviews conducted with the project partners to inform a well-timed discussion of design education and research. The project partners included HE institutions, museums and professional bodies; however, where the latter two were discussed they felt less integrated in the debate. A comprehensive introduction locates the project historically and explains the methodology of the CETLD project and the book. Chapter one analyses the position of design in society and discusses the cultural identity of designers and the variety of roles they take. The wide spectrum of design from craft to industrial design is acknowledged and highlights the difficulties this can cause in a discussion on design education. The dialogue continues with analysis of the CETLD researchers’ experience of research although this is not always clear whether the research is pedagogic or design-based. Again the differences arising in research undertaken in a variety of institutions is underlined, emphasising the difficulty of analysing such a wide topic. A lack of established tradition of design research and a lack of confidence of design researchers plus the constraints of being teacher, practitioner and researcher are pinpointed as the main problems in design research; however, no solutions are offered. Subsequent chapters explore traditional studio-based teaching methods and reassess their relevance and success. This is followed by a discussion on creativity and how it is a challenging feature within formal education for both students and teachers. Chapter five explores the relationship between design and design writing from an academic and creative perspective. The dialogue considers the contradiction of communicating visual ideas verbally and the apprehension students and teachers feel about their writing skills. 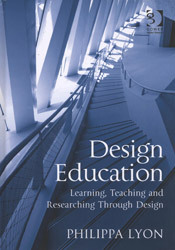 A final chapter records the use of technology in design teaching and research. The CETLD project started in 2005 and so some early projects already appear dated. A more valid investigation was whether technology steers learning and teaching initiatives or whether learning and teaching drives the use of technology. A short conclusion summarises the project but offers no answers to the questions it poses. This is probably the main drawback of the book; it remains a descriptive review that lacks comment and analysis. What the book does well is to define art and design research, to highlight the difficulties of research within the art and design sector and to be inclusive in support for those engaged in research activities. The project was obviously very successful for the partners involved, the CETLD supported 43 projects and the approach taken by Lyons was to review what was learnt by the researchers about their methods of research rather than to review the projects themselves. Whilst this was an interesting and innovative approach, the outcomes of the individual projects were not discussed and perhaps more details about research methods used would have been useful. The book would be very useful to those new to art and design teaching or approaching it from “outside” however the lack of conclusion is frustrating for established teachers but does highlight how much more research is needed in this area. Elizabeth Gaston is Senior Teaching Fellow in the School of Design at University of Leeds.